What is a West Virginia Last Will and Testament? 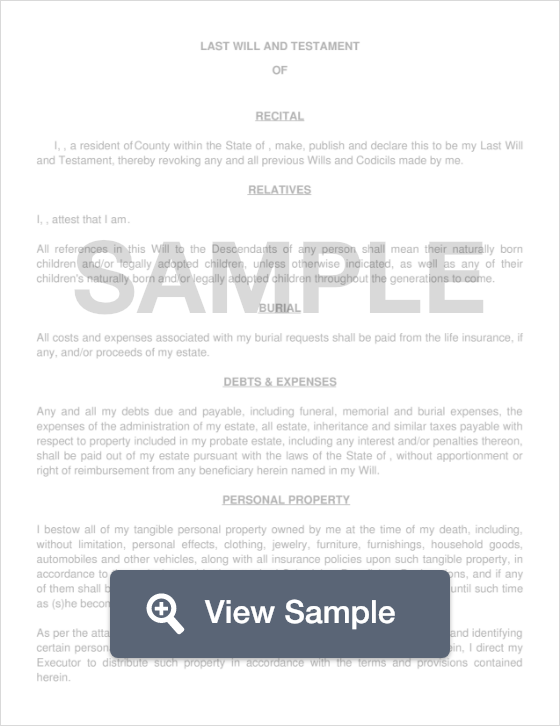 West Virginia Last Will and Testament: What Is It? A Last Will and Testament is a legal document that a person, known as a grantor, will create to specify how their personal and real property will be distributed after their death. Once the form is created, it must be signed, witnessed, and notarized to become a legally enforceable document. Once the proper steps have been taken, the Will should be sent to all of the named beneficiaries as well as the Grantor’s attorney. Though state laws vary toward last will and testament documents, they do not need to be submitted to any state entity. However, a Last Will and Testament may be registered with the County Clerks Office, Probate Courts, and certain Secretary of State offices. Witnesses - According to §41-1-3, the Will must be signed by two (2) witnesses who must witness the Testator signing the document. In addition, the Testator must be present when the Witnesses sign. Include specific information such as addresses, policy numbers, etc.